We are first time PfaP participants! We discovered PfaP on the website of our safari provider, Toka Leya Camp, a Wilderness Safaris property on the Zambezi River near Livingstone, Zambia. Packing for a Purpose seemed like such a great idea that we decided immediately to pack needed supplies for the listed school. 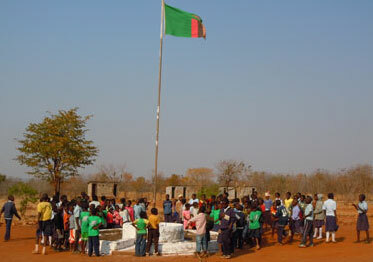 The camp provided an option to spend one morning at the school and village. 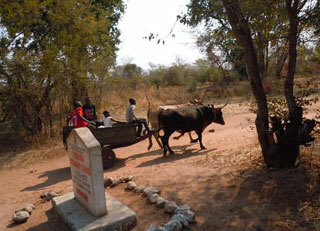 Our safari guide would take us, we could deliver the donation, and meet some of the local people. One is required to travel light for a safari trip but we packed about 8 lbs of supplies for Twabuka Middle Basic School listed on the PfaP website. It’s amazing how many helpful items can be taken! We took basic school supplies (50 pencils with eraser tops, 48 coloured pencils, boxes of white and coloured chalk, a dozen individual pencil sharpeners, and four pairs of scissors), first aid supplies (400 bandages, alcohol wipes and antibiotic ointment), a large, folded map of the world rimmed with flags of every country, some classroom posters, two large foam alphabet puzzles, several elementary-level books, an Oxford dictionary, and eighteen packages of non-GMO, heritage variety vegetable and fruit seeds for their school community garden. We packed it all in a bag with a Canadian flag so we could show them on the map where their new friends were from. 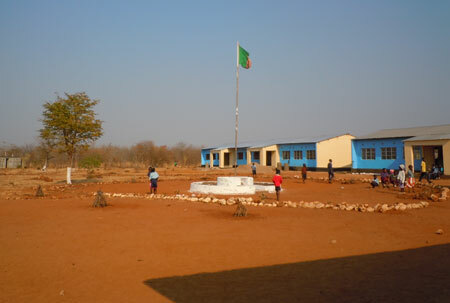 The school is in a remote location, about five miles off the main paved road along a red dirt one. Bouncing about from the giant ruts and deep potholes, our driver joked that we were getting a good “African massage.” A cart pulled by two determined oxen passed us. We went past traditional huts framed from Mupani trees and covered with termite mud, local building materials that made the huts as hard and strong as concrete. Women walked with water containers or baskets on their heads and some carried babies in slings on their fronts. A few men had bicycles and were headed to town to sell their large bags of charcoal. Everyone smiled easily and broadly and waved at us as we bounced along in the dust in the open jeep. Twabuka Middle Basic School in Sinde Village consists of several colourful bungalows and there was a palpable buzz of excitement as we arrived. It was the last day of term and the young pupils were playing outside awaiting the start of their outdoor final assembly. Teachers were busy preparing their notes and speeches. 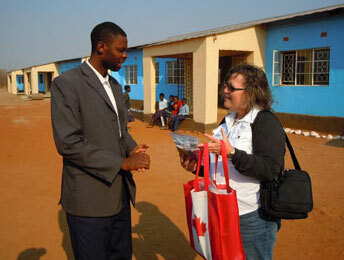 Emmanuel, headmaster of the school, rushed up and greeted us heartily and expressed his appreciation for our donations. His attention was immediately focused, however, on the seeds. He looked at each seed packet carefully, reading about the contents. He explained why they were so precious. Despite perseverance, gardening had proven to be difficult. First, the borehole had run dry leaving the initial garden parched. 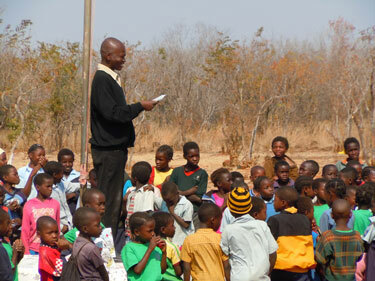 Toka Leya Camp helped get it working again and also erected two large water cisterns. The garden was replanted and tended carefully. Then, just as it was ready to harvest, elephants came in the night, ate the entire crop and trampled the beds. 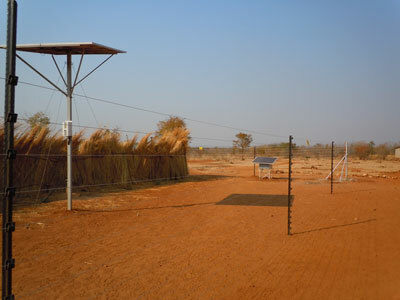 Toka Leya helped once again by erecting an electrified perimeter fence, powered by a solar panel (there is no electricity), to protect it from future elephant intrusion. A reed screen further helped to mask the garden beds. But after all of that, they had no seeds left to plant. That was why Emmanuel was so excited to receive ours. With two weeks left in the planting season, he assured us the garden would be enthusiastically replanted. The hope was that the garden could supplement the diets of the families in the school community. This was very important as up to 80% of the nearby villagers were without work. A word about the seeds – a friend who does work in Zambia advised us that these would be the most treasured items on the list. And, she was right! We were a little concerned to take them as we were travelling to both the UK and South Africa first and we feared they might be confiscated at those borders. Fortunately, no authority ever asked about them. Our morning at Twabuka School was a special part of our African trip. We were pleased to have helped and look forward to PfaP whenever possible in the future.